Once a project has one or more patterns, they can be organised into a song. A song specifies the list of patterns to play, and in which order to play them. 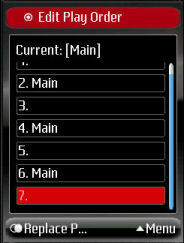 When the "Edit Song" option is selected, the following screen is displayed. It asks to select which pattern is to be added to the song. 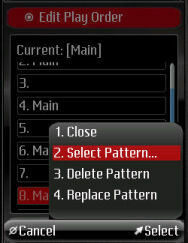 The first pattern is highlighted, and "Edit Play Order" is selected. 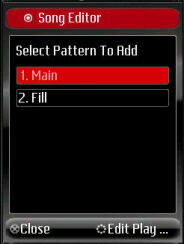 The slot where the currently selected pattern (called Main) is highlighted, and Replace Pattern selected. This inserts the pattern at the selected position and adds two blank slots (one above and one below), so that additional patterns can be added. 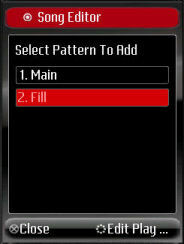 In our example, the next empty slot is highlighted, and Replace Pattern selected. This i repeated several times to insert the same pattern (called Main) to the song. Replace Pattern: replaces the currently highlighted pattern with the current one (called Main). In this example, "Select Pattern..." is highlighted and selected. 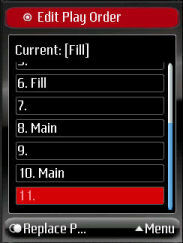 The second pattern called "Fill" is highlited, and "Edit Play Order" selected. 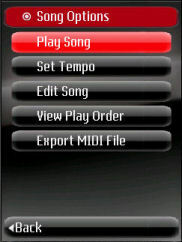 The newly selected pattern called Fill is added to the song in several places, before selecting Close from the Menu. 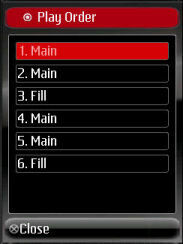 The editor is closed, and the Song Options is displayed.